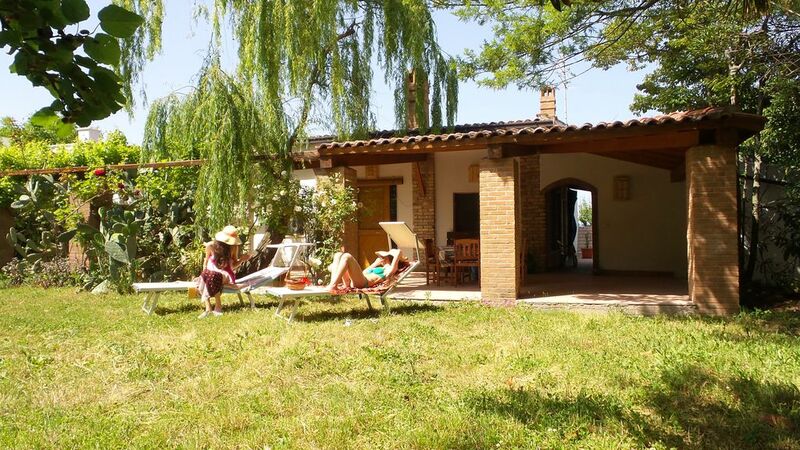 Campomarino (CB) Villa immersed in the green Molise countryside 6 km from the sea. A paradise where you can relax in the countryside but close to the coast. New Cliternia, part of Campomarino, Molise. Fully surrounded by trees and hedges and invisible from the road, the farmhouse is reached along a long olive grove and immersed in a 30 hectare land plot. It will surprise you for the peace and harmony you can breathe while staying for short or long periods. The guest apartment, completely renovated in 2016, has a living room with kitchen and fireplace, two bedrooms and a large shower room for a total of 5 beds. Guests have a private garden and a porch, a children's play area, elastic rug, wood burning stove, parking, and various outdoor showers. The garden is surrounded by high hedges and is also the ideal place for lovers of naturism with total privacy. Here you will find the pleasure of picking a fruit from a tree, making bread in the wood oven, having breakfast under the porch listening to birds singing, admiring a stunning starry sky. Relaxing osteopathic treatments can be performed. A washing machine is available for a fee. WiFi is free, such as the use of bicycles and wood-burning stoves. If you love nature and look for a place to relax this is the right place. For more information please do not hesitate to contact us for Cascina Cliternia. The bathroom, rustic style, has a very large shower. It 'very large and no architectural barriers. For our guests it is possible to request an osteopathic treatment or a massage for a fee. In addition, a laundry service is available for a fee. Ho visitato questa struttura nel mese di maggio con la mia famiglia, il pezzo forte della struttura è stato il giardino dove mio figlio ha giocato sulle altalene, tappeto elastico e vari giochi. Un posto dove rilassarsi e godersi la natura. Sicuramente torneremo in futuro. La casa è in uno splendido contesto immerso nella tranquillità della campagna e molto riservato.Corrisponde esattamente alla descrizione fornita.L'appartamento è nuovo,pulitissimo ed attrezzato con tutto il necessario(Eravamo in moto e non avevamo bagagli oltre i nostri vestiti).Situato a pochi km dal mare e comodamente disposto per escursioni nell'entroterra.I proprietari precisi sin dai primi contatti,sempre disponibili a fornire indicazioni,premurosi e attenti alle nostre esigenze.Siamo stati coccolati e ci saremmo fermati ad oltranza.Speriamo di tornare.Vacanza assolutamente da consigliare agli amanti di:natura,tranquillità e cose vere! Il Molise c'è, grazie Silvia e Fabio. I spent some days in this beautiful villa with my boyfriend. The peace and tranquility of the greenfield around the villa, the beautiful landscape withTremiti Islands, the garden and the porch made our holiday very special. Tank you to Fabio and Silvia for their kindness and hospitality. I was here with my boyfriend in June. It ' was an unforgettable vacation! The villa has been recently renovated, the apartment's furnishings are new. The peace and tranquility of the place will reconcile people with the world. The sea , not far away, is beautiful and ideal for those who love the free beach uncrowded . I spent a week with my family in this beautiful farm. A special place for my kids, a big garden and porch reserved only to us. There's also a beautiful play area for kids that my children loved very much. The villa is very quite and calm, a really peacefull place where you can relax. The free beach it's only 10min....Silvia e Fabio are very kind and always present to help us. The property is located in open countryside, in the peace and tranquility. Being the middle of a 30 hectare farm, the garden offers great privacy and tranquility. An ideal place where to spend some relaxing and quiet days with friends or family enjoying the great outdoors in the sun and sea. The sea is 7km away, and in this section you have the ability to access one of the few remaining wild stretches of the Adriatic coast where, crossing small dunes of rosemary, juniper and mastic, is accessed uncrowded beaches even in midsummer . For those who want to lidos can be reached along a few more kilometers, is Campomarino lido Chieuti. Termoli, with its characteristic old town, is only 15 minutes drive away and there you can wander through the many narrow streets, dine in local restaurants fish or even vegan restaurants. Also from Termoli you can go on daily excursions to Tremiti archipelago with a crossing by boat of about an hour. The Gargano, with its beauty, can be reached from our hotel within an hours drive. Do not forget to explore the hinterland of Molise, you will amaze you!